Junjou no Afilia’s sister group Iketeru Hearts put up quite a celebration for their 3rd anniversary on September 7th at Shibuya TSUTAYA O-WEST! This day was also quite special as it was the first official day for the group with their brand new formation, adding four new members and getting new stakeholders involved in their careers. We were there for celebrate with them! 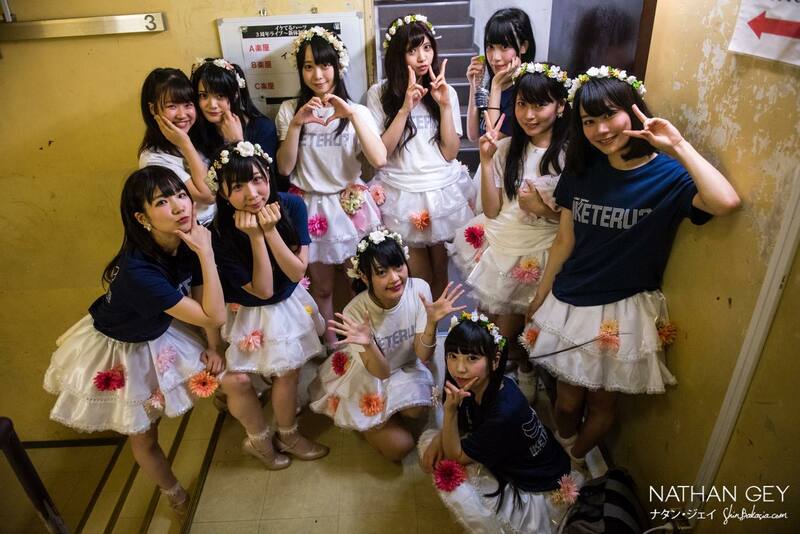 As all 11 current members of the group showed up on stage in their white dresses covered in flowers, they opened the show with their summer tour’s anthem, “Dreaming love”, and fan-favorite 2nd single “Sekai he habatake!”. The group paused quickly to introduce themselves one by one, with a specific emphasis on all four fresh faces who were making their official debut this day! Aki Imai, Risako Aise, Leia Shiroki and Shiika Koizumi are the four new members of the group from now on, and all also work at the Afilia branch cafes on the side. The second generation of Iketeru Hearts members then disappeared to let their seven elders take the stage, performing the cool “Shihin kakutei”, then moving onto their three most energetic and happily upbeat songs, “GIRL, Me”, “Otomegokoro” and “Shrimp Girl”, the fans excitedly yelling “ebi ebi! (shrimp shrimp)” for the calls on this last song’s bridge. All seven members of the first generation then paused again, to take some time to remember some of the key moments from their three years being active as idols. Youngest member Nijika pointed out that she was actually still in her last year of elementary school when they started! “You were so small!” said Kazune Manami, to which Nijika replied that she was around 130cm tall at this time, and now reaches 156cm. Yuyu Arata added that until their first anniversary, they used to only perform covers ; this was the perfect introduction to the next segment of the show, made of their best song covers from their trainee days! Funny detail was seeing Yuyu mistakenly positioning herself for the first song’s formation, causing a hysterical laughter for Kazune Manami who rolled on the floor as Arata was apologizing. This cover songs marathon was the occasion for them to perform a series of their dark and cool tracks, from “Triangle Wave” to “Soukoku no Spica”, including the now-rarely performed “Tenbu no mai, akatsuki no mon”. They then performed Afilia Saga’s “NEXT STAGE!” and “Opera Fantasia”, and finally ended the segment with their debut single “Let’s Stand Up!”, almost reenacting their first year as “Stand Up! Hearts” in just a few minutes on stage. The four new members joined again as the girls were remembering how “NEXT STAGE!” was their very first song to perform. The MC was cut short as they took position for the final segment of the show with all 11 members of the group; from “ORIGAMI”, they then performed iconic cover “Drawing again”, then their popular single tracks, “Zaishyou no Lucifer” and “Lumica Jane”. This part ended with the cheerful “Happy End”, and the group waved excitedly at their fans until they disappeared from the stage. All the fans then called their idols to come back on stage the loudest they could, and all 11 members reappeared wearing the group’s official tee-shirt over their dresses. Karin Ochi gave a long heartfelt speech, in which she confessed her mixed feelings towards all the changes in the group. “To be honest, at first, I did not want to accept having four new members with us,” she said, before explaining her words. “It felt like adding four members meant that the 7 of us were not good enough, or were not trying hard enough. But then I had a long talk with our new producer, Yukafin (note: former member of Afilia Saga Yukafin Doll), and she explained what this meant. She said that by becoming our producer, she wants to take the group to new places and make us face new challenges to grow, and that adding new personalities to the group was just a way for us to take this new step.” Everyone got teary-eyed as Karin did her best to convey her feelings, before concluding. “Now, I can say that I am very happy that Aki, Risako, Leia and Shiika joined us,” she confessed, before adding one more thing. “I just turned 19 and I thought about it a lot, but the main reason why I am still an idol now is because I love Iketeru Hearts and every single one of its members so much!”. Her speech was followed by a huge salve of applause, as both fans and members congratulated her for finding the strength to confess all of her purest feelings. Yuyu Arata and Kazune Manami then took advantage of everyone’s high spirits to announce some news about their upcoming 5th single! To be released on October 25th, the single will be produced by their new creative director Chiyomaru Shikura, and is titled “Karma Stripe”! To which Rie Tachibana tried to tease the fans a little more by hinting towards a very cute costume – and, maybe, knee-high socks?! The show ended with a repeat of their tour song “Dreaming love”, then the very fitting “Believe in my dreams”, and after everyone gave each other a tight hug stating how happy they were to be 11 members in the family now, Iketeru Hearts left the stage. But this is just a brand new beginning for the slowly-rising group!